The Percussion Collective gave an unforgettable performance in the Soundings: New Music at the Nasher series. Dallas — I can’t recommend going to an all-percussion concert when you have a migraine, as I did on Friday. But under pretty much any other circumstance, the March 1 Soundings: New Music at the Nasher performance by The Percussion Collective was a can’t-miss experience. Occurring concurrently with not only the opening of the Dallas Opera’s Manon Lescaut and a Dallas Symphony concert featuring Tchaikovsky’s Violin Concerto, Soundings nevertheless managed to pack the house, as has been the case for every Soundings concert I’ve attended. This kind of attendance is far from universal at “new music” concerts in the Dallas area, so what is Soundings’ special magic? Is it the venue? Maybe, although galleries are inaccessible by concert time, so you’ll only get passing glances at any of the sculptures. Is it the free wine and champagne? It can’t hurt. But it’s also the astonishing level, consistently, of the musicians Soundings brings to Dallas. 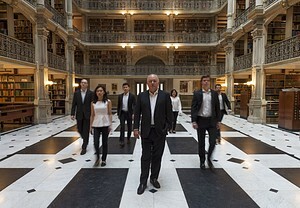 The Percussion Collective is a group of young musicians, some of them university faculty members and others full-time performers, who play in variously sized groups to present music for percussion ensemble. Friday’s concert employed four percussionists—Ji Hye Jung, Matthew Keown, Ian Rosenbaum, Sam Seyong Um—and an enormous array of instruments. The first half of the program was set up as a sort of theater-in-the-round, with the four musicians at the four corners of the “stage,” backs to each other. A (mostly) meditative piece, Salvatore Sciarrino’s A Rustling of Thirty Years began the program. With its organic sounds of waving tree branches and swishing water, the piece was almost hypnotic, but any trance was periodically broken by the crash of dropped objects or metal bars clanging. Like all of the Percussion Collective’s Friday program, this was performance art almost as much as music. Because it’s rather difficult, on a program such as this one, to know when a piece is truly over—have the rustling leaves ceased, or just paused?—the group wisely chose to begin the second piece attaca, without pause, after the first. It was James Wood’s Village Burial with Fire, a piece which could not have contrasted more dramatically with Sciarrino’s meditative rustlings. Here, a Hindu burial ceremony is evoked, using rhythmic vocalizations and microtonally pitched xylophone-like instruments as well as an enormous quantity of other instruments, both conventional and obscure, found and created, to suggest the inspiration for Wood’s piece. Later, whisperings of, perhaps, Latin, a tubular bell reminiscent of a cathedral chime, and rosary-like shell clickings evoke a Catholic Mass, then the character shifts again, to end with the unison percussion and piano, with piano moving in and out of phase with the drummers. This was truly masterful performing, and it is a lesson in getting capacity crowds to contemporary music performances. If the Nasher can fill its hall for a percussion ensemble, then perhaps there is a more robust market for contemporary performances than we might believe. It’s not just the free wine, I don’t think.